Last year during the holidays, I posted the fruitcake recipe that my mother and I had developed and enjoyed baking before Christmas. This season, I had an idea to try and come up with a fruitcake cookie. Because I planned to give most of the cookies away as gifts, I was happy with the huge number of cookies our recipe produced. Mama and I had adapted our recipe after much experimenting, so I knew it worked as a cake – but how would it taste as a cookie? After I watched Ina Garten make her fruitcake cookies, I used our recipe but added her technique of chilling the dough, slicing for cookies and baking in a medium oven. Success! A big thank you to Susan of The Wimpy Vegetarian, for inviting me to be a part of “Cookie Love Blog-Hop”. So much fun! TIP: This recipe makes a lot of cookies. Although they freeze well after they have been baked, you could also freeze a log or two of the unbaked dough and bake them off later. 1. Rinse the candied cherries and combine in a very large bowl with all the dried fruits and walnuts. 2. Using a stand mixer with a paddle attachment, beat the butter until light. Add the sugar and mix well until fluffy. 3. Add 3 of the eggs to mixture, then 2 cups of flour. Mix well. Add last 3 eggs and final 2 cups of flour. Mix well. 4. Add the lemon extract, zest, lemon juice and vanilla to cake batter and combine. 5. Pour the batter over the fruit and nuts. Use a sturdy spoon or spatula to combine ingredients. Batter will be very stiff. 6. Divide the dough into quarters and roll each 1/4 into a 16 inch log that is about 1 1/2 inches in diameter. Roll each log in buttered parchment paper, place on 2 cookie sheets, and chill in fridge until firm, at least 2 hours. 7. Preheat oven to 350 degrees. 8. Remove dough from fridge, discard the plastic wrap, and cut into 1/2 inch slices. Place on lined cookie sheets. 9. Bake 15-20 minutes until golden brown. Cool on racks. This elicits memories of holiday Houska making – pretty much a Czech Challah with all the candied fruits and walnuts mixed in. I wish I had seen this for my Secret Santa package! Would love to see your Houska recipe! You have been so very busy Liz! These cookies look really tasty, my husband would enjoy them for sure as they are so very British indeed 🙂 They have such a nice light color too, as opposed to the very dark, treacle-looking british ones. Great post! Oh man, I’ve been there. This happened to me this week on a cookie I was experimenting with. Luckily I made a LOT. These look really great Liz! And I just love the idea of turning your wonderful cake recipe into a cookie, since cookies are just dry cakes. I think you’re going to be our next baker in the group! Thank you for including me in the Cookie Love Blog-Hop! These look lovely! Im a real fruitcake fan so these really appeal to me! I couldnt be left alone in a room with them – yum! 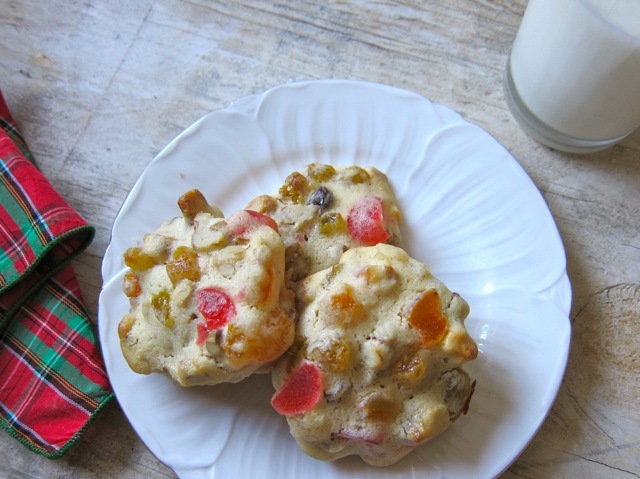 I’m not a big fan of most christmas cookies but I LOVE fruitcake and would love getting a gift of these! I threw the rest of the batch in the freezer so we stopped eating them…Glad to meet a fellow fruitcake fan. I love this recipe – little mini-cake bites. Thanks, Lynda – I’m going to bake my next batch a little less than the 15-20 minutes so to get the texture a bit more dense.